Is owner of the s.y. Norman, 213 tons, which was designed by Messrs. Gardiner and Cox, and built in 1895. The Norman is one of the handsomest steam yachts in America, and is fitted with triple expansion engines. 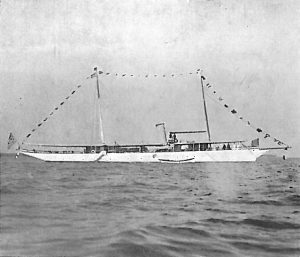 In September, 1903, she won the cup of the Indian Harbour Yacht Club, beating the Seminole by 16 minutes 8 seconds. She averaged in this race a speed of 17 knots over a distance of 50 nautical miles. She is elegantly fitted. Her length o.a. is 163 feet 7 inches, l.w.l. 135 feet, and beam 18 feet 9 inches, The owner of Norman is a well-known American yachtsman. Clubs: New York, Larchmont, Seawanhaka, Corinthian. Address: Lincoln Trust Building, 208, Fifth Avenue, New York.